Established in the Karapinar Organized Industrial Area, existing area of the bulghur factory is 120 thousand square meters, its project area is 62 thousand square meters and indoor area is 24 thousand square meters. The factory, which has a capacity of storing 36 thousand tons of wheat, has wheat processing capacity of 120 tons per day and the bulghur to be obtained as a result of this is approximately 90 tons per day. Pangev Karapinar Bulghur Factory, where all kinds of bulghur can be produced, is one of the most modern facilities in Turkey and the world with its technology and automation system in the facility. Control and monitoring of production during the process from the purchasing of the wheat to being turned into end product are carried out through full automation systems. A high quality production process is carried out in terms of taste, aroma and color. Production is made by ensuring the highest level of hygiene and sanitation environment, which is one of the most important elements in food. The fact that the facility has state of the art machinery and equipment ensures its efficiency, and its energy expenses to be lower. Automation process in Karapinar bulghur factory begins when the wheat enters the facility. All analyses for wheat, which is defined and registered with vehicle recognition and barcode system, are conducted with precise laboratory devices in preliminary acceptance laboratories. Wheat vehicles, which are given barcode according to quality criteria and registered, are sent to discharge and then to be taken to silos. Wheat is put through preliminary purification process and some foreign bodies in the wheat are separated before it is taken to the silos. Temperature control and ventilation processes of the wheat in silos are monitored via a computer system. The facility has the capacity of storing 36.000 tons of wheat in total in 6 silos, each of which have a capacity of 6.000 tons, and 2x150 ton/h discharge capacity. Wheat, taken into the process to be turned into bulghur, is first subjected to preliminary purification process. All foreign bodies in the wheat are separated in cleaning machines at this stage. One of the elements, which affects quality of bulghur is its good purification. At this stage, there are world class state of the art machinery and equipment and devices, which separate according to color, are used at Karapinar Bulghur factory. Cooking and drying is one of the most important stages, which affects quality of bulghur. What distinguishes Torku wheat from the others is that the cooking and drying stages, which have extremely impact on quality, being carried out on machinery with high technology under full automation system. 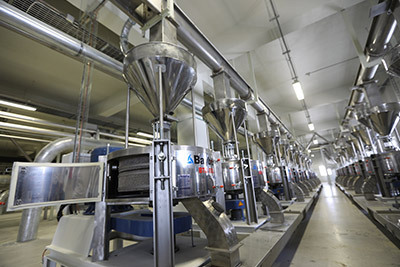 Homogenous cooking and drying is ensured with this system, which is used for the first time in Turkey. Purified wheat is kept at heating vessels at certain temperatures and then steam cooked at high pressure and temperature. Complete gelatinization of starch without disintegration of wheat kernels and all kernels to be cooked homogenously without any parts remaining uncooked is ensured. Boiled wheat, obtained after cooking, is subjected to preliminary drying and drying stages in steps to ensure all kernels are put through a homogenous drying process to have the same level of humidity. All surfaces, which come into contact with the product, consist of materials, which are suitable for food and stainless. Cooked and dried bulghur, which is called “live” is obtained after the drying stage. 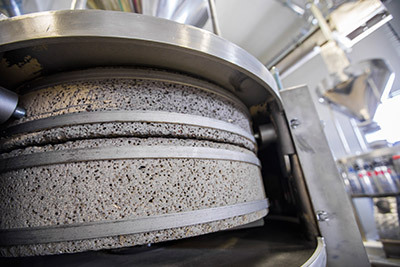 Live is put through peelers at this stage and then broken in natural stone mills, sieved in sieves and put through shining process, if necessary, and then transferred to the silos. The facility also has a roll breaking system. State of the art machines and devices are used at this stage as well. The product is put through devices and purification machines with optical readers, which can separate according to differences in color and specific weight before being transferred to packaging silos. Products, which are produced in hygienic conditions, untouched by human hands, are put through weighing control devices and metal detectors. Product, kept under suitable storage conditions, reaches the consumers with Torku Catalhoyuk brand via its sales network, which reaches throughout Turkey. Karapinar bulghur factory has laboratories, equipped with modern devices, to conduct all kinds of analyses, tests and checks at all stages, starting with raw material to end product.